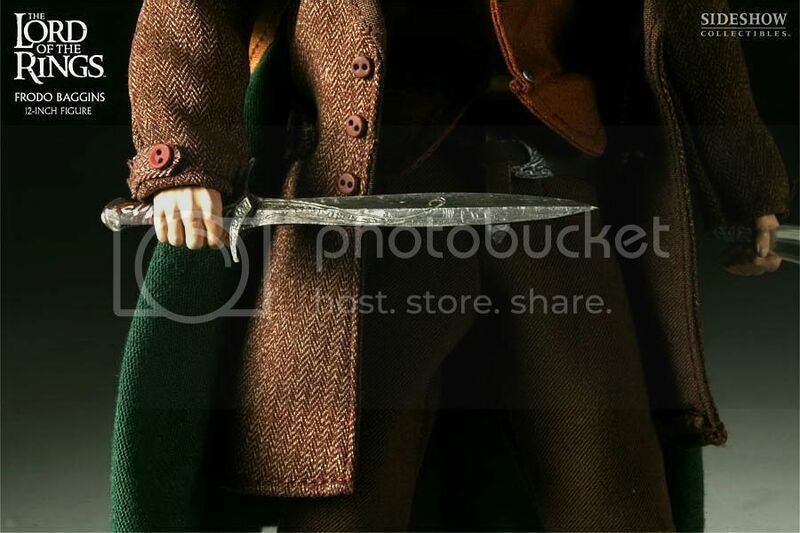 I am the new owner of Sideshow’s one-sixth scale Sam and Frodo! Yep, I ordered them with my Christmas money in January and they finally have arrived. I had to send the Frodo figure back (scraped-up belt for Sting’s scabbard and a spot of missing paint on the arch of his right nostril—couldn’t have that! ), but a better version should be arriving very soon. Sam is here, arriving in great condition. He is unpacked, accessorized, and standing guard in the special glass-doored cabinet I have provided for them. Just in case there are some of you out there who have never heard of these figures, and might like to get one or both of them (there still are some left—probably from cancelled orders due to the state of the economy), I am including a link to Sideshow’s page for them. 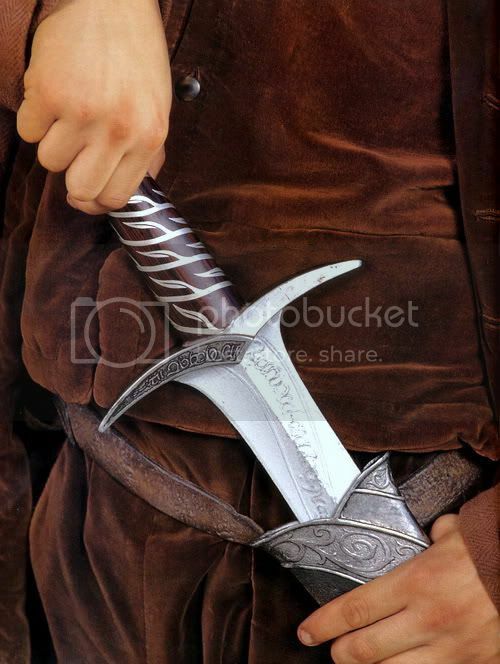 Here’s the link for Frodo’s page at Sideshow, and here’s the link for Sam’s page. I am so pleased with these figures! The only other costly piece of Frodo "art" I have bought is the Mount Doom Diorama, which depicts Frodo and Gollum fighting at the edge of the Crack of Doom. I think it's a sensational piece, even if it dramatizes a moment in the trilogy that never happened in canon. But I was never willing to spend the money on any other pieces. 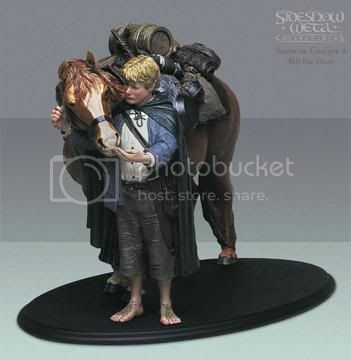 I did not like Sideshow's statue of Frodo in Moria, for instance. 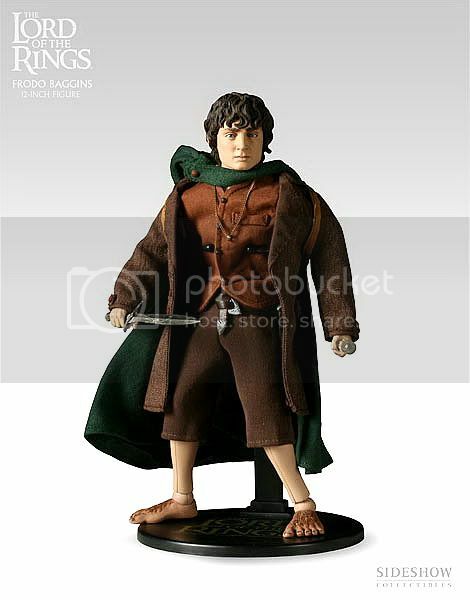 It's good as statues go, but because the statue only vaguely resembles film Frodo, I didn't consider buying it (especially at 250.00). 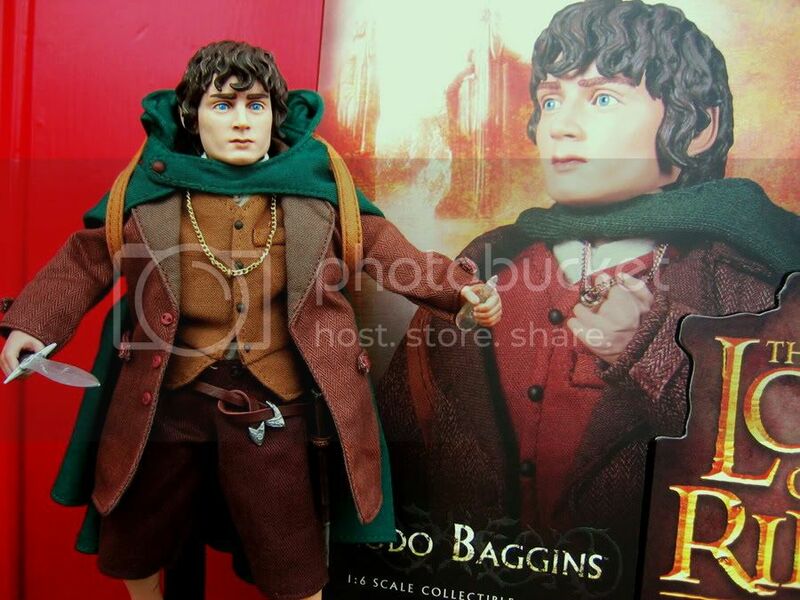 I thought my 6.99 “Two Towers Super Posable Frodo” bore an infinitely better likeness to the original. But these new one-sixth scale figures look so great—and so like their film counterparts—I had to order them. I've posted copies of the pics posted at Sideshow below for those of you who don’t want to buy them but would like to know what they look like. The real items—both the figures and their clothes and accessories—look very much like the figures shown in the official photos. I was *not* disappointed. Here’s my Sam, standing in his case. His sweater in my image has a distinct reddish cast, perhaps from the reflection from the reddish wood inside the case. It's really brown, but darker than what is shown in the Sideshow online images. 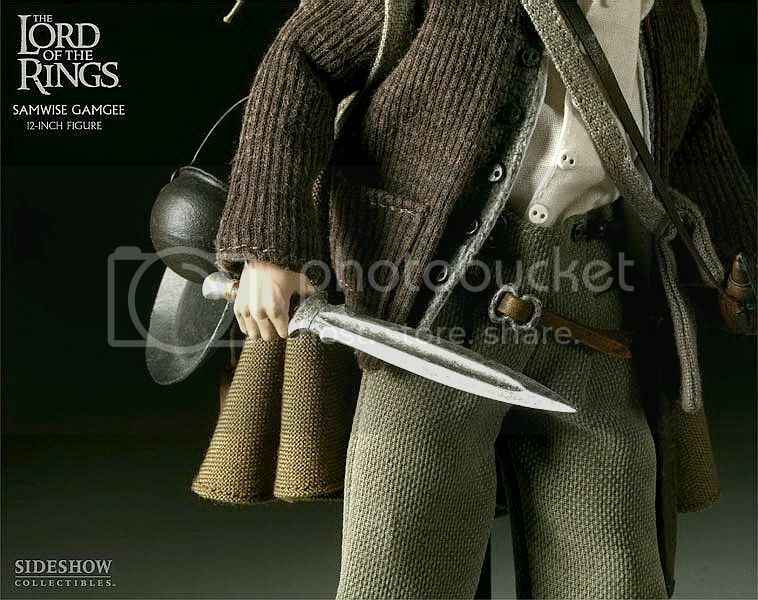 I think it's a beautifully done figure, right down to his smallest props (he's holding a wafer of lembas in its mallorn wrapper, and his pipe is tucked in his grey shoulder bag). 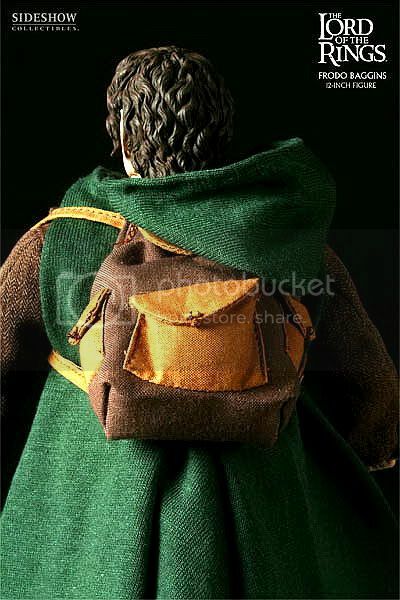 The colour in my photo is not quite faithful, but note that although the colour of the Frodo figure’s waistcoat is very like the image from Sideshow’s site (above), it not as dark or as red in colour as the waistcoat he wears in the film (see below). The waistcoat of my doll is a sort of golden tan, not the plummy brown Frodo wore. But the brick-red waistcoat worn by the doll on the cover of the box is not any better. It is far too red. I don't see why they didn't just use the colour of the film waistcoat. It's not as though they didn't have a plethora of great reference shots to go by. 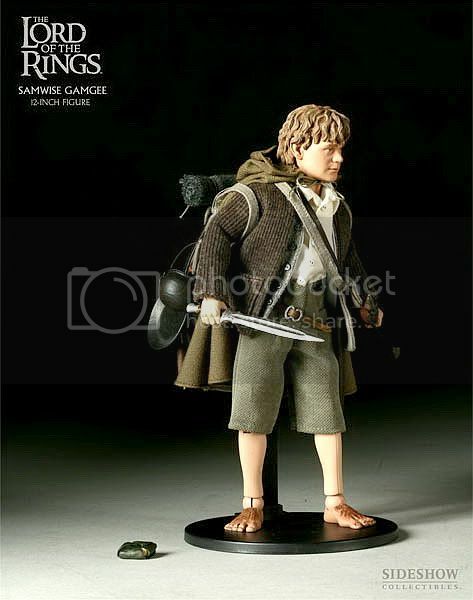 That's my only real complaint on the design of the Frodo figure. Yay! It's lovely to have Frodo and Sam in your home. I have the posable dolls. They sit on a shelf with their arms around each other. Ohhhh! I've sen that on Sideshow's "no longer available" list. It looks great. I think they do, in fact, do some great work. There's a fabulous Aragorn, an excellent Galadriel, and some wonderful portrayals of other figures. It's Frodo that seems to have been the problem character to "get". I am so happy you got the dolls, too, and are enjoying them. Aren't they lovely? 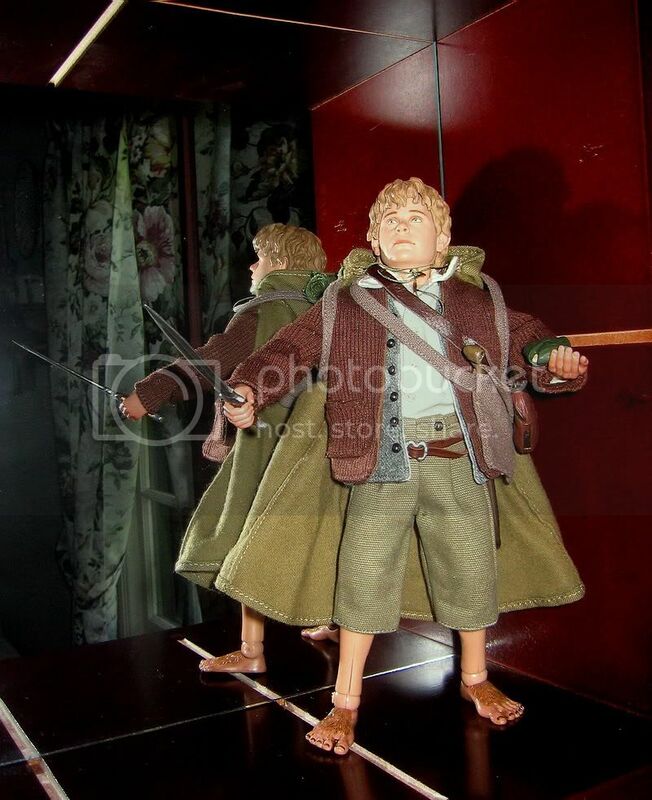 There's a Bilbo Sideshow made in the first series, a small little figure, that I would love to have. It was inexpensive when it was produced a few years ago, but now it's only available from private seller for lots of money. 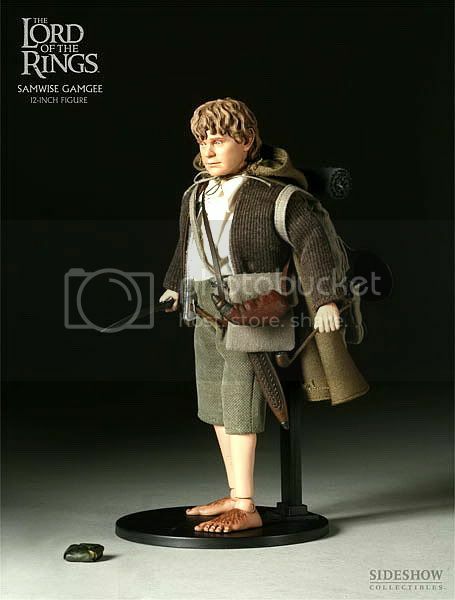 The Bilbo and Sam figures please me the most by far of the hobbit characters they have done. I've never seen the Merry and Stybba. I'll have to look him up on Ebay. 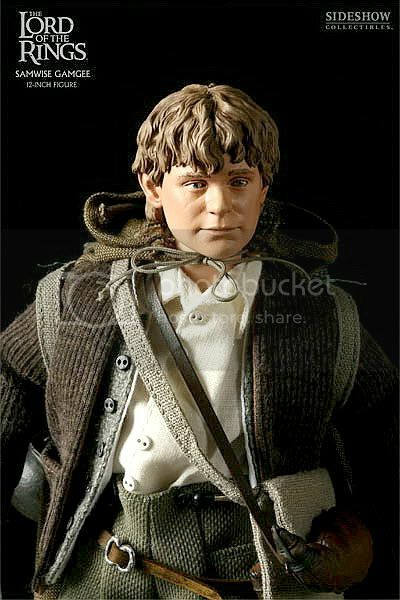 I only owned one action figure all these years (Two Towers Super Posable Frodo, who is great), but Jan threw temptation my way, sending me links to Ebay auctions of figures. Now I have a shelf full. But the Mt. Doom Diorama remains the star piece, to me. The other action figures that impressed me were the Frodo and Sam in orc armour and Bilbo standing on a barrel giving his farewell speech. Oh--I forgot to say there's a mid-sized action figure of Theoden that I think is terrific, which I saw at a toy store when it came out, but didn't buy it. I've seen it for sale on Ebay but I am not [yet] willing to pay the extra it now costs. Gosh, the accessories are amazing! Enjoy your new "lads"! So beautifully done. I've often wondered why it's been so difficult for the various artists who have worked on LOTR figures to get Elijah's face right. There is an ethereal beauty about him that seems elusive to render in a statue of any material. They've come really close with this 12 inch figure. 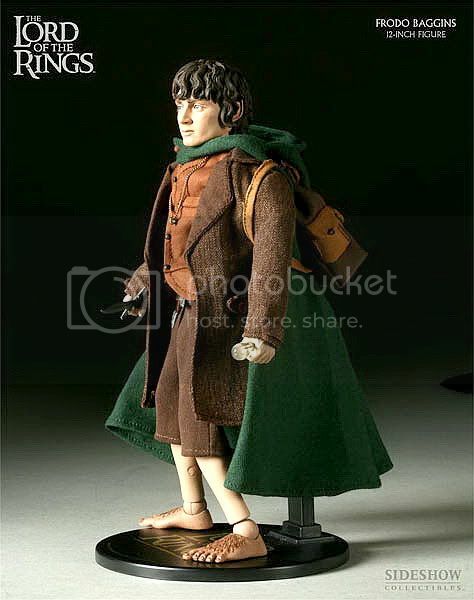 The real image of your Frodo is better than the catalog one. Good Eru, this feeds in to my intense longing for the heady, giddy times of a few years ago, when LOTR fandom was in peak activity! I guess if there ain't no cure for the summertime blues, it's best to just wallow in them for a while. I've often wondered why it's been so difficult for the various artists who have worked on LOTR figures to get Elijah's face right. Me, too, Goldenberry. I think we even talked about it in the Harem towards the end. 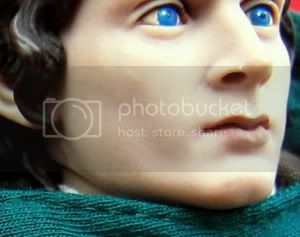 Elijah's Frodo has such strong, distinctive features (artists love caricaturing him), and so chiseled, bone-wise, you'd think he'd be the easiest, not the hardest character to portray. Many fan artists have rendered his face faithfully and beautifully. Just think of Whiteling's drawings, for a good example familiar to you. Yet professional artists at Sideshow seem to have had the devil of a time trying to recreate his face in figures and sculptures. I have wondered if the artists assigned simply resisted doing an exact reproduction, wanting to "correct" his face to more nearly match their own personal visions of Frodo. i have it too! i got it last week sometime but haven't had time to share or squee about it yet on LJ-- I got the Frodo one but didn't get the Sam one yet-- it's the loveliest Frodo yet! I hope you can get the Sam figure eventually, Periantari. It's really excellent. I think I agree with jan-u-wine (who also ordered these, receiving them even before I did) that Sam's "doll" is actually better-done than Frodo's. As she said in an email, there seems to be something about film Frodo's essence or mood or something that artists have a very difficult time capturing in figures. Also, you have to goggle over the intricacies of Sam's tiny gear. 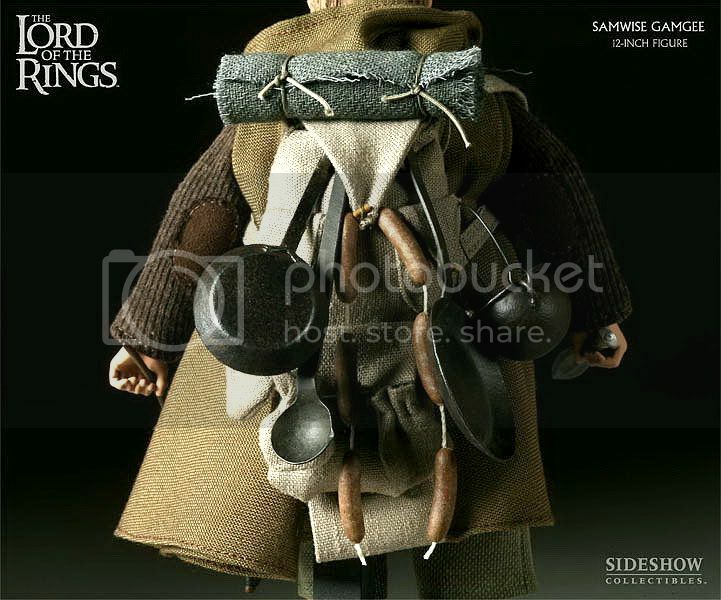 Sam's simply got more "stuff" that goes with his outfit than Frodo, who travelled much lighter. Hey Mech!! Thanks for sharing these photos. Now you have Frodo and Sam to talk to. Will you tell them to please be very careful? The journey...a little dangerous. Hi, Alyon! Yes, they are going to be displayed in the same case -- not doing anything risque (*wink*), since I'm not that sort of fan, but they are together, which is as it should be, considering what a great duo they are in literature and the hearts of LotR fans. I can't wait to get my new Frodo. I so hope his face is all right and I don't have to send him back again. The flaw was not huge, but it was quite visible if one gave his face more than a passing glance. How did I miss these entries? I got my Bingo Frodo doll right about the same time! It was my reward for being employed again. I'm very happy with it. 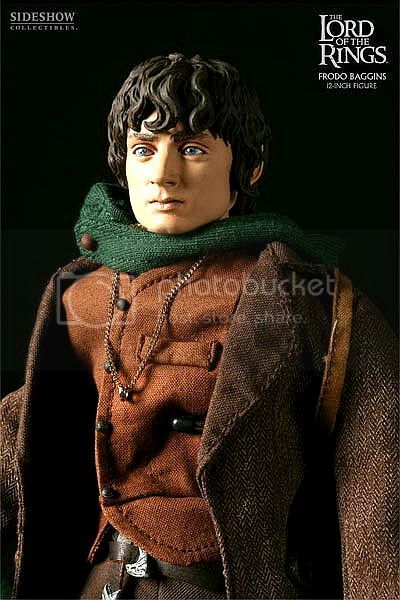 Your doll's face looks much closer to the box version and the real Frodolijah. The eye brows are painted heavier on mine and there is less blue in his irises, and his face seems thinner. It makes his face a little less pretty, but also older looking. I'd love it to look like the box version, but I kind of like it like this because it's closer to my mind's image of my Bingo Frodo before the movie. The Sam doll is really lovely--I may have to splurge sometime and get him, too. That sounds so charming! If you have taken a photo of your setting, please post a copy here or link it. I'd love to see it. My replacement Frodo's face is also very good. It still has a manufacturing flaw, but not as glaring a flaw as the one I sent back. Sam, however, is *perfect*. His doll really is extraordinarily good.